If you haven't submitted yet please do and get engaged in the Nexus. I just opened Surrey Forever my Universities Alumni newsletter to see the sad news that Professor Anthony Kelly 'our Vice Chancellor' of Surrey University had died. As an undergraduate at Surrey University I had the pleasure of seeing and experiencing our VC, as he liked to be called, during a difficult time when the government was increasing tuition fees for overseas students and self financing students. In March 1977 like other universities across the country we prepared to go into occupation over the tuition fees increase which would come in in September. I was elected to be Press Officer for the occupation which had been endorsed nearly unanimously at a meeting of over 1500 students. We then marched on the University Senate building where the University Senate was actually meeting about the same issue under its very able Vice Chancellor Tony Kelly. Will we be asked to pay the cost of stranded oil assets in the climate change process? It has been an interesting six weeks on the issue of climate finance. The most recent prophetic announcement was around the UN Secretary General’s Climate Summit. It is becoming clearer daily that climate change WILL pose a risk to the value of present investments. There were 350global institutional investors representing around $24 trillion in assets calling for government leaders across the globe to put a price on carbon, to help redirect investment on the scale required to combat climate change. For those who did not read the finance pages, The Rockefeller Brothers Fund, a charitable foundation set up in 1940, has been working from 2010 to align its endowment investments to be consistent with the foundations Sustainable Development program goals. We have come a long way from the meeting in Solo in July, 2011 when Paula Caballero Gomez from Colombia floated the idea of Sustainable Development Goals as the replacement for the MDGs in 2015 with the support of the governments of Guatemala and Peru. For those who have been part of the discussion, the last 3 and half years shows how difficult it can be to develop policy at the intergovernmental level. It also has been one of the most open and transparent processes that I have seen while working at this level for 25 years. 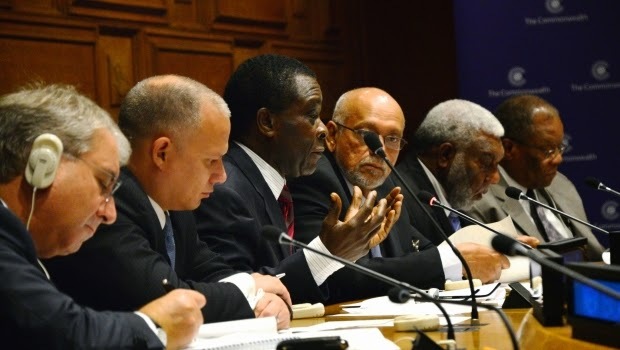 We, Leaders of the Commonwealth, representing over 2 billion people and over one quarter of the United Nations membership in our 53 member states, with extensive diversity in our growth and development, present the following shared views on the Post-2015 Development Agenda. Our perspectives on the Post-2015 Development Agenda are based on our shared values and principles as expressed in the Commonwealth Charter as well as our individual experiences. We welcome the inclusive inter-governmental process in the United Nations to achieve a concise, compelling, ambitious and balanced development agenda beyond 2015, building on and reinforcing existing agreements, and recognising the many outcomes that may feed in to the intergovernmental process. Following the success of the 2014 Nexus Conference a 2015 one will be held from the 15th to the 17th of March in Chapel Hill North Carolina. The Nexus 2015 conference will again have an opportunity to input to the Sustainable Development Goals process and will bring together in March governments, intergovernmental organizations, academics, local government, the private sector, NGOs and other stakeholders.